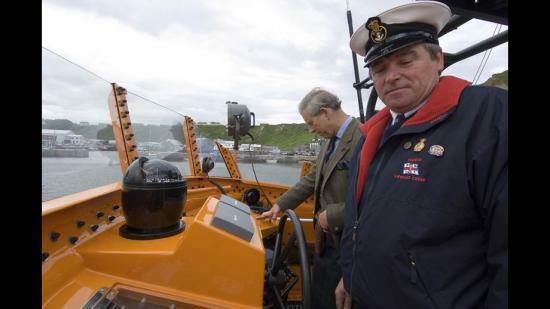 Bill ‘Wing' Munro the Coxswain for the RNLI Thurso lifeboat will retire on Thursday 26th October having served at the station for almost 48 years. Wing Munro, 65, has served on the crew of the Thurso lifeboat for 47 years, 9 months and as full-time Coxswain for just under 16 years. As Coxswain Wing has overseen countless shouts and been involved in some of most noteworthy rescues undertaken by Thurso Lifeboat Station's volunteer crew, he has also received multiple awards from the Institution. One of Wing's most memorable shouts is the September 1997 rescue of the 50 foot Aztec scallop boat which had fouled its propeller in Loch Eriboll (a sea loch west of Thurso) Whilst on route to the rescue the Thurso lifeboat, The Queen Mother, lost one of its engines but continued to the aid of the Aztec’s crew. Under Wing’s command the crew successfully reached the Aztec, in extremely rough conditions, and towed her safely back to Scrabster Harbour. In recognition of his bravery and the bravery of his volunteer crew Wing received the RNLI Thanks of the Institution on Vellum. In July 2011 Wing and his volunteer crew rescued twelve tourists from the rocks of the Island of Stroma, in the Pentland Firth, after the tour boat they were travelling in became stricken. The six military personnel on-board plus their wives decided to abandon ship. Recounting the story Wing attributes the successful rescue of the group to their military training and survival knowledge. In a letter to the RNLI after the event one of those rescued said he couldn’t: "praise highly enough the bravery, professionalism and manner in which your team went about extracting us from the rocks... It probably wasn’t the most difficult rescue Wing’s crew has carried out, but to us every man was a hero of enormous proportions and we will be eternally indebted". One of Wing’s more recent rescues was to a scallop diver, in May 2017, who Wing describes as "very lucky" to be alive. The diver spent 11 hours in the water before signalling to a fishing boat and then being picked up by the Thurso RNLI Severn class lifeboat.